In a small bowl, combine Mai Tai mix, rum, vodka, bourbon, and tequila. Fill 8 small plastic glasses with several raspberries and lemon and lime slices. Top with Mai Tai mixture, leaving a small amount of room at the top of each plastic cup. Pour 1/4 tablespoon of grenadine slowly down the inside of each glass so it falls to the bottom and creates the red layer. Set wooden spoons into the center of each glass in such a way that the fruit holds them upright. Set plastic cups in a 9x9-inch metal dish and place in freezer until fully frozen, about 4 hours. Serve and enjoy! Leave out the liquor and add a little lemonade to the mix for an alcohol-free version. Boozy enough to taste great, but not so boozy that they won't freeze = the best summer chill-out ever. It’s like meeting old friends in a new place. Or new friends in an old place. Or whatever that déjà vu feeling is that makes you think “Whoa!” and “Duh!” all at once. Prepare to feel that about a frozen pop. Long Island Iced Tea Fruit Pops, people. Why didn’t we think of this before? This delicious recipe is all the more glorious because it’s so simple. It starts with Mai Tai mix. Yeah, yeah, it’s Mai Tai mix. But, turn the bottle around and we’ve got the secret to making superquick Long Island Iced Teas. Bada bing! A lot of premade mix, a little bit of liquor, and you’re ready to rock. 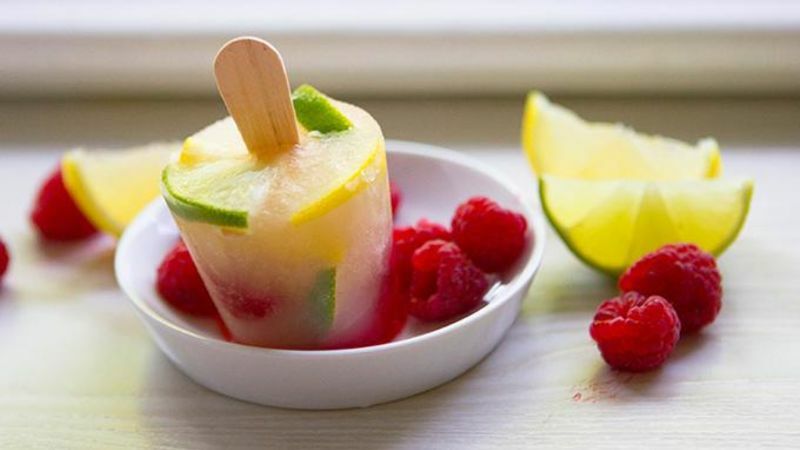 Get some pretty fruit ready – raspberries, sliced limes, and sliced lemons. Grab some plastic cups and mini wooden spoons. First, add the raspberries to the bottom of each cup. Then the lemons and limes. Now pour the prepared Long Island Iced Tea mixture in each cup, until about 3/4 full. Situate the wooden spoons so the fruit holds them upright. Gently pour a bit of bright red grenadine down the sides of the cups so it slides to the bottom to add the most gorgeous ruby-colored top to your pops. Freeze until firm, about 4 hours or overnight. Then pull those babies outta the freezer and prepare to meet a new friend in an old place. Or ... you know. The Pop of Your Life. Simple, splendid, and so so cute. What could be better for summer?